In recent years, science has allowed us to explore beyond the realm of everyday experience into unfamiliar and exciting territories. However, many of these new frontiers do not lie on a distant planet or in a deep ocean ecosystem, but rather delve into the very core of human life, where it begins and how that inception determines one’s life path. Dieter Egli, a developmental biologist at Columbia University, is conducting research that investigates the use of CRISPR, a powerful technology that can edit human genomes to repair mutations in human embryos. While his research may lay the groundwork for preventing genetic diseases in future populations, it raises serious ethical concerns about how such actions should be regulated, and whether scientists should truly leave their footprints in the human genome at all. CRISPR, short for CRISPR-Cas9, is a tool originally used by bacteria and archaea to protect their genomes from viruses. Scientists use guide RNA that binds to a specific region of DNA that encodes for a certain trait of interest and then use an enzyme known as Cas9 to cut out this DNA region, much like a pair of scissors. The researchers then provide a template strand of DNA that the cell incorporates into the genetic code in place of the old segment allowing the genome to code for a new trait. This technology can be used to remove DNA that erroneously encodes for a trait resulting in a genetic disorder. For example, Dieter Egli’s research focuses on altering a genetic defect that causes retinitis pigmentosa, an inherited form of blindness, which would allow patients afflicted with the disorder to have children with normal vision. While DNA editing provides tantalizing possibilities that could potentially reduce future human suffering, it is vital to recognize the notable repercussions that come with such responsibility. For example, while the use of CRISPR is heavily regulated across the globe, loopholes still exist that could allow scientists with the right information to make unethical choices. 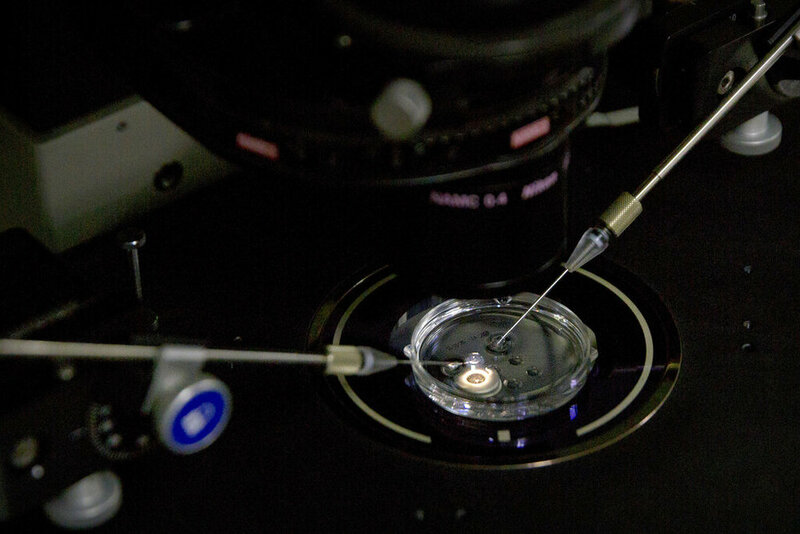 In the United States, the federal government is not allowed to fund research involving human embryos. However, no such restrictions exist for private funding. There are also examples of scientists going “rogue,” so to speak, with gene editing that indicate that such occurrences could easily happen again, with greater consequences, as our knowledge of genetic modification increases. For example, last year, Chinese scientist He Jiankui broke the country’s laws when he conducted experiments leading to the world’s first gene-edited babies, twin girls Lulu and Nana, whose modified DNA make them resistant to HIV. Without the proper regulations, editing of human embryos could quickly turn into recklessly forming genetic wish lists: Creating designer babies with desirable physical traits such as increased intelligence, strength or height. Since this technology is expensive such treatments would gradually create a socioeconomic divide where the rich could afford to genetically tailor their offspring to have every advantage, further separating classes. In addition, much still needs to be learned about human genomes and the factors that contribute to a strong gene pool in a population. For example, variation in the traits present in a population increases a group’s resistance to disease (a virus may kill some members but enough genetic variation exists that some may be immune). However, if all humans were genetically edited to have the same DNA, the population as a whole could be weaker and more susceptible to pandemics. While scientists have made great progress in understanding DNA and its influence, many gaps still exist in our knowledge, especially for traits that are encoded for by several genes or certain DNA codes that may cause offspring to develop a disease but actually benefit the parents. For some disorders, if an individual has one diseased copy and one unaffected DNA copy, he/she may pass on the diseased copy to children but have a trait that is favorable in the environment. This is known as the heterozygous advantage: For example, individuals with one copy (or allele) for sickle cell disease will not display symptoms but are resistant to malaria. Complicated interactions such as these between genes and the environment further muddle how DNA should be altered by scientists. Overall, it is unwise to entirely ignore the vast possibilities presented by this field of research. However, it is important that scientists proceed with caution, keeping discoveries closely guarded and further tightening guidelines on editing human genomes as our capacity for making drastic changes increases. We hold the power to rewrite the future of our species through our genetic code, but it is important to fully understand the consequences of our actions before a plot-twist irrevocably alters our dreams into nightmares. Kate Lee is a contributor to The Daily Campus opinion section. She can be reached via email at Katherine.h.lee@uconn.edu.